If you want to have children, be ready to pay — it will set you back nearly $250,000, according to a new U.S. government report. The average cost to raise a child born in 2013 to the age of 18 is $245,340 for food, shelter, education and all other expenses, the U.S. Department of Agriculture found in its annual report on family expenditures. The good news: That’s the lowest annual increase since 2009. The bad news: That’s likely to change as housing prices – the greatest single expense in raising a child at 30% of total cost – is expected to rise as the U.S. economy continues to recover from the financial crisis. The worse news: Education and day care costs are continuing to rise – on average, those expenses ate 18% of the average family’s income in 2013, compared to only 2% in 1960, when the USDA first began studying the data. That mirrors a report last year that found that the cost to send an infant to day care is now higher than in-state college tuition and fees in 31 states. Figure in the cost of sending a child to a four-year university education, a cost not factored in the USDA report, and the cost balloons dramatically. The average cost per year — including tuition, room and board – for a public, four-year undergraduate program is $18,391 and grows to nearly $41,000 per year for a private, four-year program, according to College Board data. The actual cost of raising a child born in 2013 will rise to $304,480 over the next 18 years with projected inflation at 2.2%, the report says. Costs vary depending on income bracket and location: High-income families in big Northeastern cities such as New York and Boston are projected to spend about $455,000 to raise a child. Rural, low-income families spend much less, an average of $145,000, the report estimates. Overall, the location with the highest average cost is urban areas of the Northeast at $282,480; urban costs in Western cities average $261,330, followed by cities in the Midwest ($240,570) and urban areas in the South ($230,610). 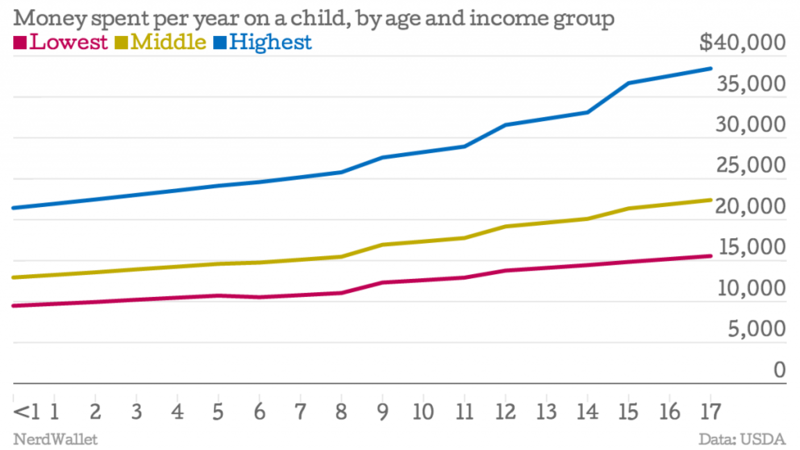 Child care is the second biggest cost for middle income families, a cost unheard of when the USDA began tracking the data. Like all costs, the average expense of day care varies widely depending on location. The average cost is $11,666 per year, but prices can range form $3,500 to nearly $19,000 a year, according to the National Association of Child Care Resource & Referral Agencies. “The average annual cost of full-time care for an infant in center-based care ranges from $5,496 in Mississippi to $16,549 in Massachusetts,” a 2014 report from Child Care Aware shows. A survey by Care.com earlier this year found the average person paid $18,000 a year on child care, but nearly half the families surveyed don’t budget for that cost. The cost of child care is believed to be the reason why nearly 30% of American moms are now setting aside careers to stay at home to care for their children, according to a report from the Pew Research Center earlier this year. 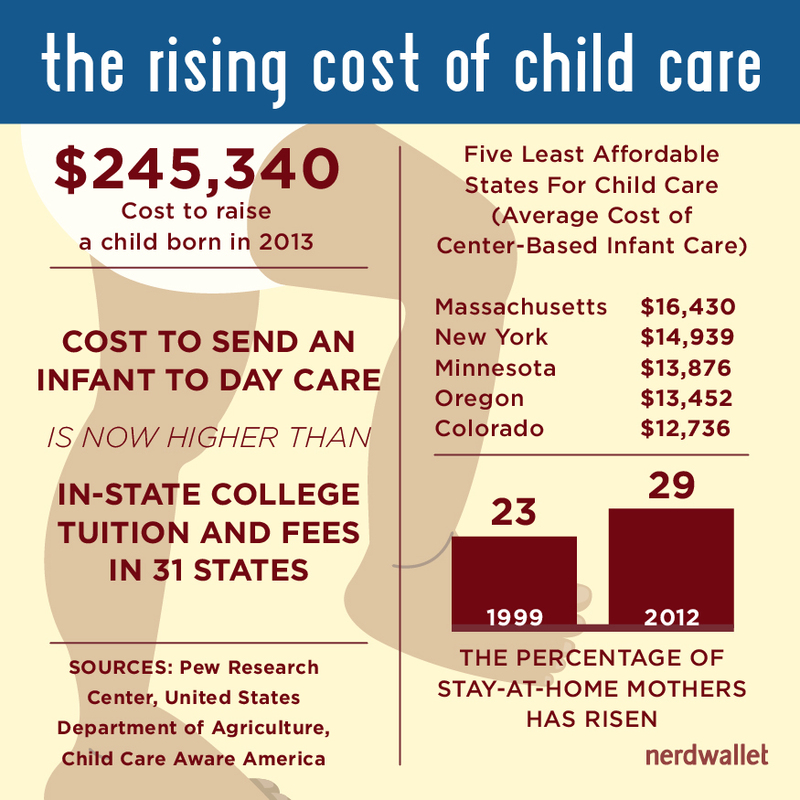 Read more on NerdWallet: Wait, Day Care Is Now More Expensive Than College? We want to know your thoughts on this article. Meet us over on Facebook, Twitter, or Google+ to join the conversation!